We are the leaders in manufacturing Brass Zari / Jari Wire also called Yellow Touch Zari Wire & Golden Touch Zari Wire. 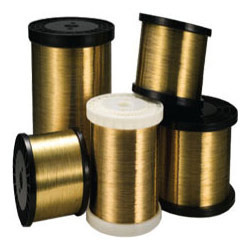 Our wire is mainly used in the textile and handicraft industry in India & also exported widely. We are very flexible in supplying as per the specifications of our clients and we customize the size, alloy specification and packaging of our product for our clients. We have the technical and quality superiority in this field and our Zari / Jari Wire is preferred by users all over India.